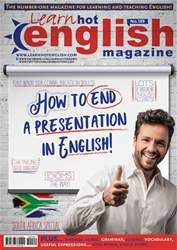 Digital Subscriptions > Learn Hot English > 189 > 9 WAYS TO END A PRESENTATION... WITH A BANG! There are two parts to a presentation that are really important: the start and the end. You need to make sure that both these sections are really memorable. Here are 9 ways to create a spectacular ending!